Guess what you guys??? I hit double digits on my book blog! 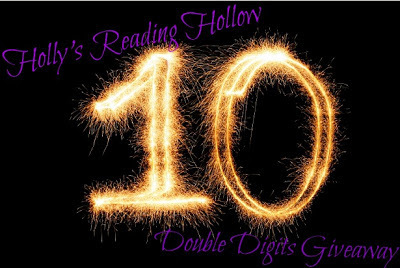 Meaning: I can now say I have officially posted TEN book reviews on my blog! Whoopeeeee!! And to celebrate this small accomplishment, I'm having my first ever giveaway! Make sure to leave a comment under my BOOK REVIEW of the book you'd like to win because that will be how I know what ebook copy you want if you win! 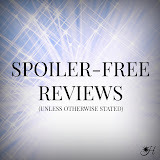 (Links to all my reviews are below the Rafflecopter.) I'll be contacting the winner via email within 24 hours of the end of the giveaway. Good luck and thank you for being a part of my book blogging journey thus far! Hey! Thanks for the giveaway. 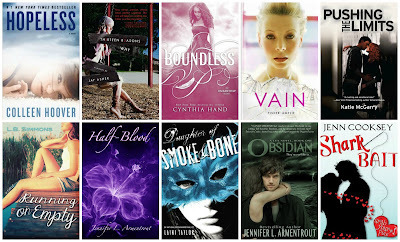 The books I was most looking forward to this year were Requiem and The Elite. Now I am waiting for Star Cursed by Jessica Spotswood, and of course who isn't waiting for the third Divergent book?? Thank you very much for the giveaway. I think I'd like to read "Hopeless"by Colleen Hoover or "Boundless" by Cynthia Hand. Their reviews make you want to read them. I'd love to read "Dare You To" and "Crossing the Line", since I loved "Pushing the Limits". I know both are already released, but I would love to read them both this year.